Peter aka Petee is a Crested Chinese Maltese mix and the result of a fling of daddy pure Crested Chinese and mom pure Maltese. Both were AKC registered and were NOT supposed to get together to breed. But as things turned out one moment of not paying attention at the breeder made it possible - and thus Peter came to life as offspring of Tinkerbell's Baby ( mom ) - Looks wise he resembles more the Maltese side of mom, with long white coat but has a few streaks of caramel color in the ears and back. He is very playful, spoiled rotten and gets along great with our miniature Schnauzer Max and most other dogs. Not sure about cats though since he has little or no contact with them. He loves to cuddle and his favorite travel spot is on my wife's neck looking out the window while riding in the car. At night he sleeps with us curled up behind our back or behind the knees - totally relaxed and stretched out full length. The only thing we are still working on is being fully potty trained, he still thinks occasionally he can do his business where ever it pleases him even though he knows how to get in and out the dog door into the yard at all time, and goes out and does business there too. When we get home after being gone for a while he is totally excited to see either of us back at the house and wants to be hugged and gives doggy kisses - and loves to lick ears! He's about 1 1/2 now and 8 lbs! He is a great companion and super sweet dog, and would be even better once we can get him to go potty outside! Always in a good mood and loves to play and spreads joy around wherever he goes! You've acknowledged that this dog was an accident, breeding him would be so unethical. 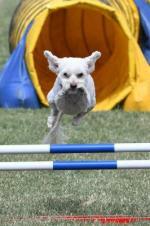 please consider all the health tests that should be done before breeding a Chinese crested. SO many things can go wrong. Millie (Millie Moo) is our Crested Maltese mix and I cannot imagine life without her. We got her a 8 weeks and at 5 weeks when we visited the litter, she chose me! She wouldn't leave me alone and that was me sold. We have had a few issues with potty training but that is because we've moved house 3 times in her 1 year life and so that's confused things. She loves other dogs... our friend got a puppy from the same breed and when they have play dates they don't leave each other alone. Very sweet. Her brother is just as cute... looks more maltese than millie does and is a lot more placid, but Crested Maltese mixes are just the sweetest dogs and would recommend this mixed breed to anyone looking for a kind, obedient, loving, affectionate companion. 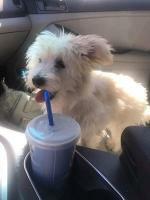 Benji is registered as a Maltese but he looks like a Chinese Crested Malt. Our Chinese Crested Malt is 10 years old. 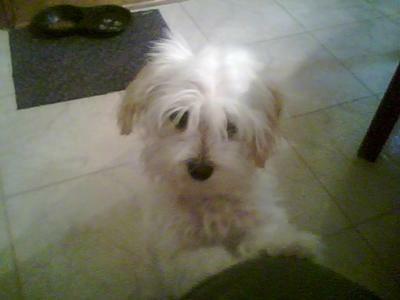 His dad was a Maltese and his mom a Chinese Crested. He weighs 10 lbs and never goes over that. He dances and smiles and is generally a sweetheart. Although when I quit my job to stay home with my grandchildren 4 years ago he became very protective and does not like strangers much. If someone comes to the house he goes crazy until he realizes that my husband or I know this person... then he's all over them! He really is a gem and my husband and I adore him! He is black, gray and white with lots of hair! I would def get another Crested Malt without hesitation! Chinese Crested Maltese - I think?! Teddy Bear was my best friends dog for about 8 months and then she needed to find him a good home, he was her 'baby' and it was difficult for her. As soon as we met Teddy he melted our hearts and we decided that we would take him home and welcome him into our lives and knowing Teddy the way we do now (after only two weeks) I understand how hard it would be to lose him. 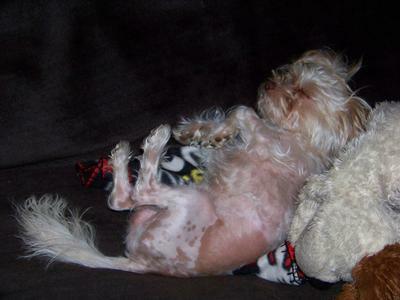 When we adopted Teddy we were told that he was a Shitzu, Maltese, Chihuahua mix but I used to show dogs and wanted to be a Judge at one point so as soon as I saw him I thought that he looked more like a Chinese Crested Maltese mix. The hair on his head and shoulders feels like silk and you can see his skin. It is so fine and as it gets further down his back he becomes bald on his thighs, sides and belly. He has more hair on his feet and tapering down his tail. He has a little more hair on his back (a soft down) but most of his hair is on his head. If anyone thinks it's other than a Chinese Crested mix, I'd be interested to know people's thoughts on what he could be crossed with. Comments for Chinese Crested Maltese - I think?! Although your photo doesn't look like a Crested Malt, everything you've said describes a Crested Malt. Well Teddy is a part of the family well and truly now. I really don't know what I would do without him to be honest. He is my baby boy and he is so special. I couldn't ask for better temperament, he loves kids and other dogs, he taps my leg to tell me needs to go toilet, he lets me know when someone is at the door which is handy as I am deaf in one ear. He never really grew much more hair but has developed a short peach fuzz on his back and thighs now. He didn't grow much bigger than this. 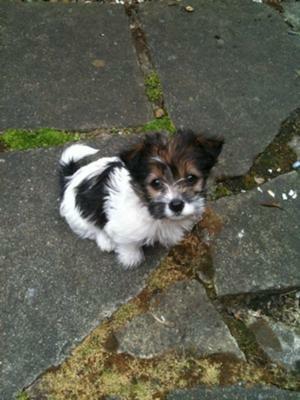 I am so glad I took the little fella on, my life would not be the same without him. Love my Teddy so much :) he is amazing. Definitely has Chinese Crested. :) They are the sweetest dogs. My Chinese Crested's name is Bernice...She's angelic. what a sweetie! His facial characteristics strongly remind me of my Zoe, a Maltese mix that I have suspected is part Crested. She has the mottled skin, & her fur is wavy & covers her whole body, but so thin you can see her skin through it. 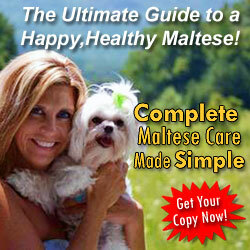 A DNA test only confirmed Maltese, but the database didn't include Crested. Whatever the mix, I'm thrilled to have her b/c she has brought tremendous joy to my life, as I'm sure Teddy has to yours! First of all, Teddy looks like a real sweetie! His facial shape & coloring remind me a lot of my Zoe, a maltese mix rescue I got in 4/09. I have wondered if she might not be a Crested Malt. She has the mottled skin coloring, & while she does have hair all over her body, it's more wavy & kind of sparse, not like the long, thick silky hair of the Maltese. I did a DNA test on her & the only thing that showed up was Maltese, but the database didn't include Crested. 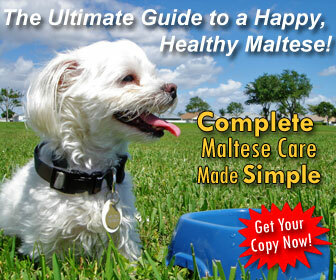 I am almost certain there is another breed involved, however, b/c her features aren't entirely typical of Maltese alone. Whatever the mix, she has been a delight to me & everyone who knows her. This is a great ending to a super story and I agree w/ you on the breed guess - so happy you have this baby!